Law of Return – The Law of Return of 1950, the Nationality Law of 1952, and the Entry into Israel Law of 1952 establish the right of all Jews and their family members worldwide to immigrate, or return, to Israel and to immediately become Israeli citizens. A close reading of these laws reveals that the 1950 Law of Return treats every Jew worldwide as having “returned,” including those in Israel/Palestine who were born in Israel and never left. After 1948, the majority of Palestinian people, those who did not become citizens of Israel, settled in the other parts of Mandatory Palestine, including the West Bank, which became part of Jordan, and the Gaza Strip, which came under Egypt’s control. Others fled or were expelled from the territory that became Israel and ended up in refugee camps in the West Bank, the Gaza Strip, Transjordan, Syria, and Lebanon. Thus, the founding of Israel rendered the Palestinians a stateless people who retained a sense of national identity, but were dispersed across a broad range of jurisdictions – mirroring in a tragic way the status of the Jewish people prior to the founding of the state of Israel. What does it mean that Israel is a “Jewish and democratic state”? Is this merely a descriptive claim, meaning that the majority of its citizens are Jewish? Or does it imply something deeper insofar as Israel was founded as “the sovereign state of the Jewish people”? Perhaps this deeper meaning implicates only the laws of return and citizenship, granting Jews special rights to citizenship that are denied to all others, including the indigenous Palestinian population. Or does the “Jewish nature” of the state include other forms of preferential treatment for Jews (such as land ownership, voting, and other social and political rights)? In what way is the state of Israel a political tool that “belongs” to Jews both within Israel and in the larger global diaspora? “Israel is defined, internationally … and internally … as the Jewish people’s nation state.” Is there a point at which the uniquely Jewish character of the state of Israel undermines its identity as a democratic state? – Everyone has the right to a nationality. – No one shall be arbitrarily deprived of his nationality nor denied the right to change his nationality. Transferability of Israeli Citizenship – Israeli citizenship is not automatically transferrable if one is not a “Jewish national.” That is, Israeli citizenship is automatically passed to the spouse of a Jewish Israeli, but not for non-Jewish Israelis. They may petition to have their spouse gain citizenship but these petitions are rarely granted. The 2003 Nationality and Entry into Israel Law was passed by the Knesset and it prohibits the granting of any residency or citizenship status to Palestinians from the 1967 Occupied Palestinian Territories (OPTs) who are married to Israeli citizens (amended in 2007 to include citizens of “enemy states” Iran, Iraq, Syria and Lebanon). Palestinian citizens of Israel who marry a Palestinian resident of the Gaza Strip or the West Bank are faced with two options: Either leave Israel and go to the place of one’s spouse, or leave one’s spouse in order to stay in Israel. The Law affects thousands of families comprised of tens of thousands of individuals. The Israeli press described the law as part of a larger campaign on the part of the Israeli government to “make it more difficult for non-Jews to receive Israeli citizenship or permanent resident status in Israel”, a move “aimed against granting legal status to Palestinians and other foreigners who have married Israeli citizens,” and “based on the demographic consideration of ensuring a solid Jewish majority.” The Chairman of the Israeli National Security Council explained the need for the law: “the growth in the size of the Arab minority would lead to increased demands on its part for national rights and more pressure to turn Israel into ‘a bi-national state’ or ‘a state of all its citizens.’” The Israeli Supreme Court upheld the law in 2012. The Court frames the issue as one of a “suspect” classification based upon national origin. What do you think of the framing of “Arab Israeli citizens” as a “national origin” or “religion” -based class? The Court distances itself from U.S. Supreme Court law by noting that: “I am prepared to assume — without ruling on the matter — that there are situations in which treatment that is separate but equal is lawful.” What do you think of the example the Court provides to illustrate this idea? What do you think of this principle of “positive discrimination”? Israeli Prime Minister Benjamin Netanyahu and then-Justice Minister Tzipi Livni proposed more tempered versions of the bill. The proposals declare that the “right of National Self Determination in the State of Israel is unique to the Jewish People.” What implications might this have for non-Jewish minorities in Israel? Can non-Jews in Israel argue that this provision in the proposed law illegitimately denies their right to self-determination? What would that argument look like? Can the “right of return” for diasporic Jews to Israel be understood as a key aspect of Jewish self-determination? If so, why aren’t Palestinians in the diaspora entitled to a similar right of return? Article 27 of the International Covenant on Civil and Political Rights (ICCPR) sets forth that:In those States in which ethnic, religious or lingual minorities exist, persons belonging to such minorities shall not be denied the right, in community with the other members of their group, to enjoy their own culture, to profess and practice their own religion, or to use their own language.Does the proposal’s language “right of National Self Determination in the State of Israel is unique to the Jewish People” run afoul of Article 27 of the ICCPR? The “individual rights of all [Israeli] citizens” are to be “specified by any law.” Does limiting personal rights to those “specified by any law,” risk rendering the clause effectively useless when the “law” itself is discriminatory. The law’s core aim in declaring Israel as the Nation-State of the Jewish People would result in the state officially associating itself with only some members of its citizenry, including with respect to heritage, symbols, holidays, and the role that Hebrew law plays in interpreting legislation. What might be the implications of having the state officially associate itself with only some members of its citizenry? Do the proposed changes contained in the “Nationality Law” risk amplifying the distinction between nationality and citizenship in Israel in ways that may further marginalize non-Jewish citizens and/or Palestinians living in the West Bank and Gaza? Finally, do you agree with the bills’ critics that they elevate Israel’s identity as a “Jewish state” over its identity as a “democratic state”? Do these bills merely surface an underlying impossibility that lurks in the tension between democratic values and the entho-nationalism of political Zionism? Do these measures merely ratify explicitly what has been an implicit fact, that Israel is and has been a “Jewish state”? World Zionist Organization – Jewish Agency (Status) Law Sec. 1 (1952). “We entered this war because violations of right had occurred which touched us to the quick and made the life of our own people impossible unless they were corrected and the world secure once for all against their recurrence. What we demand in this war, therefore, is nothing peculiar to ourselves. It is that the world be made fit and safe to live in; and particularly that it be made safe for every peace-loving nation which, like our own, wishes to live its own life, determine its own institutions, be assured of justice and fair dealing by the other peoples of the world as against force and selfish aggression.” President Woodrow Wilson’s Fourteen Points, 8 January, 1918. Unlike most industrialized countries, which have widespread private land ownership and a free real estate market, in Israel the state controls 93 % of the land (80% is owned by the state and 13% by the Jewish National Fund). According to Israel’s Basic Law: Israel Lands (1960), lands controlled by the state, the Development Authority and the Jewish National Fund are known as “Israel Lands.” The JNF was founded in 1901 by the World Zionist Congress as “the custodian of the land for the Jewish people.” After the founding of Israel in 1948 and land previously owned by Palestinians was seized by the state and “[t]he JNF purchased the land from the state starting in 1949 and early 1950. 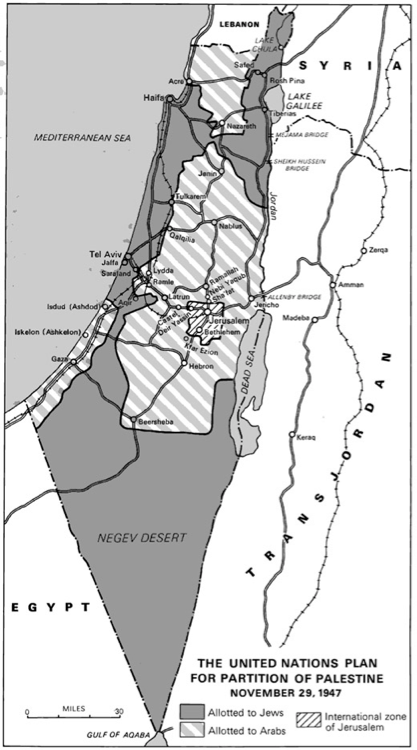 Then prime minister David Ben-Gurion initiated the sale of land to the JNF to prevent any possibility of international pressure forcing Israel to restore it to the Palestinian refugees.” Amiram Barkat “Buying the State of Israel,” Haaretz, February 10, 2005. The land is leased in 49-98 year installments from the Israel Land Authority. See the Israel Land Authorities’ website, and the JNF’s website. For a history of the JNF, see Walter Lehn, “The Jewish National Fund,” Journal of Palestine Studies, vol. 3, no. 4 (1974). “The mission of gathering in the exiles, which is the central task of the State of Israel and the Zionist Movement in our days, requires constant efforts by the Jewish people in the Diaspora; the State of Israel, therefore, expects the cooperation of all Jews, as individuals and groups, in building up the State and assisting the immigration to it of the masses of the people, and regards the unity of all sections of Jewry as necessary for this purpose.” World Zionist Organization – Jewish Agency (Status) Law Sec. 5 (1952). See Ilan Sabin, “Minority Rights In Deeply Divided Societies: A Framework For Analysis And The Case Of The Arab-Palestinian Minority In Israel,” 36 New York University Journal of Int’l Law & Politics, 885 (2004) at 962, n. 300.